Our new push up bar stand are a great way to enhance the overall development of the upper body, including both the chest and triceps. Three components per stand snap together for easy assembly. By gripping the handles of the stands, you'll enjoy a greater range of motion during push-ups, helping your muscles develop even more efficiently. 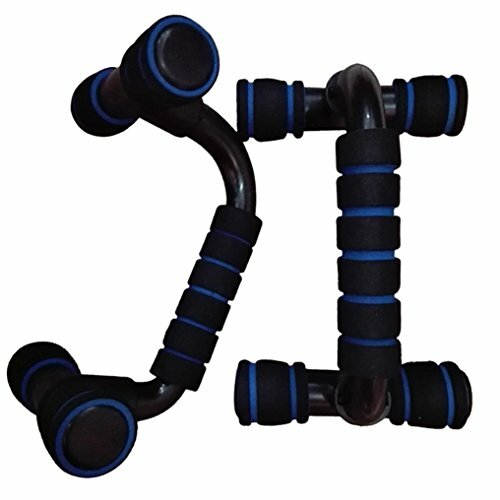 What's more, the stands are extremely compact, it lets you get in a great workout anytime, anywhere. Maximize your strength training and handstand to headstand routine, yoga arm balance practice, bodyweight or CrossFit circuits with our product. These easy to assemble and high quality elevated push up bars are ultimate strength training equipment tools for muscle development and toning. HIGH INTENSITY PUSH UP STANDS - Amplify your workout to the next level and increase definition in your arms, shoulders, chest, triceps, and abs, muscles, engaged. Complements any existing home gym equipment and also versatile accessories on its own. SMART AND INTUITIVE DESIGN - Integrated knurling grip options (similar to barbells and dumbbells) for confident and feel-good hand grips on comfort-rounded. Ideal to train your upper arms and triceps. NON-SLIP, STABLE BASE - The non-slip rubber base securely grips well on all floor surfaces, so you definitely won't fall flat on your face mid way through your push-up. Enhanced support for all levels of conditioning fitness allows you to make the most out of where you are. LIGHT AND PORTABLE - So you can always squeeze in a workout wherever you go, from the office to your hotel room. 4 non-skid rubber feet for maximum stability, and sleek matte powder-coat finish for sweat resistant anti-slip hygiene.